Professor Christos Faloutsos is awarded an honorary doctorate degree from The Aristotle University of Thessaloniki, the largest university in Greece. 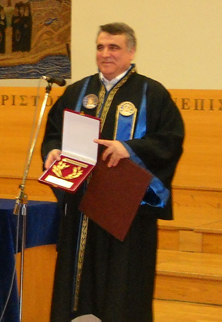 The title of Doctor Honoris Causa was conferred to Faloutsos during a May convocation, one of a number of events that marked the 20th anniversary of Aristotle University's Department of Informatics. Faloutsos presented a convocation address on "Mining Large Social Networks: Patterns and Anomalies." The following day, he presented a lecture on "Influence Propagation in Large Graphs: Theorems and Algorithms." Faloutsos' research interests include data mining for graphs and streams, fractals, database performance and indexing for multimedia and bio-informatics data. He and his students also have devised software for identifying previously unknown accomplices on Internet auction sites that help others perpetrate fraud. His cross-disciplinary work is widely and regularly cited. An influential 1999 paper he wrote with his computer scientist brothers, Michalis and Petros, on the distribution of connections across the Internet was honored with a Test of Time Award in 2010 at SIGCOMM, the premier computer communications conference. That same year, Faloutsos received the Innovation Award from the Association for Computing Machinery's Special Interest Group on Knowledge Discovery and Data Mining. Other honors include the National Science Foundation's Presidential Young Investigator Award and the International Conference on Data Mining's 2006 Research Contributions Award. Faloutsos earned his bachelor's degree in electrical engineering at the National Technical University of Athens and his master's and doctoral degrees in computer science at the University of Toronto. He came to Carnegie Mellon as a visiting professor in 1997 and joined the faculty of the Computer Science Department the following year.